clearly states “let no man therefore judge you” concerning those things mentioned, yet that is what people do when they hear people talking about Feast Days and New Moon Days. The language used in Colossians 2 tells us that these “are a shadow of things to come.” They are not in the past and have not been done away with as many have assumed and taught. The use of the word “are” indicates they are still in play. A shadow is cast from the object from which it originates. We know that Yahushua was the substance of what the Spring Feast Days foreshadowed. He was the Passover Lamb that was sacrificed on “the preparation day of the Passover” (John 19:14). And He was the “first fruit” offered on the sixteenth day of the first month (1 Corinthians 15:23; Leviticus 23:10-12) when He was resurrected and went to heaven. In Leviticus 23 it is said, “concerning the feasts of Yahuwah, which ye shall proclaim to be holy convocations, even these are My feasts” (Leviticus 23:2, emphasis added). Three times we are told “it shall be a statute forever in all your dwellings throughout your generations” (Leviticus 23:21, 31, 41). This is talking about three specific feast days or holy convocations (Leviticus 23:4) when Elohim would and still does meet with His people, and we can see from Colossians 2:16-17 that they “are a shadow of things to come.” These include the Feast of Passover (Leviticus 23:5), the seven day Feast of Unleavened Bread with the wave sheaf offering (Leviticus 23:6-15), Pentecost (Leviticus 23:16-21), Feast of Trumpets (Leviticus 23:24-25), Day of Atonement (Leviticus 23:27-32), and the seven day Feast of Tabernacles (Leviticus 23:34-36). We will examine these “shadows of things to come” in our study of Daniel 12. There is ample evidence that the disciples observed the Biblical weekly and annual feast days during their lifetime and when Easter was being promoted in the second century there were many that stood stiffly for the observance of the Passover which many of the half-converted pagans to “Christianity” were seeking to replace with Easter. Before the eight-day weekly Julian calendar came into existence in the first century BC, that was the predecessor of the seven-day Roman Calendar which was the predecessor of the present-day Gregorian Calendar, there was what is commonly referred to today as the Lunar-solar Calendar based on the phases of the moon and the rotation of the earth around the sun and the rotation of the moon around the earth. The weekly and the annual feasts of the Bible were determined by this calendar, specifically by the new moon (Psalm 104:19) which included how the weekly Sabbath was determined (Leviticus 23:2-3, Psalm 104:19, Genesis 1:14). The Biblical Calendar established by Yahuwah at Creation in Genesis 1:14 was and still is the method to be used to determine the specific times the feast days are to be observed by Elohim’s people. Passover occurs on the fourteenth day of the first month. The Feast of Unleavened Bread begins on the fifteenth day of the first month and lasts seven days. The Wave Sheaf Offering occurs on the sixteenth day of the first month or the day following the first day of the Feast of Unleavened Bread which was also a weekly Sabbath. Pentecost always occurs on the day following the first Sabbath of the third month and is the ninth day of the third month. The Feast of Trumpets occurs on the first day of the seventh month. The Day of Atonement occurs on the tenth day of the seventh month. And finally the Feast of Tabernacles begins on the fifteenth day of the seventh month and lasts seven days. See Leviticus chapter 23. The months and days of these feast days are determined by the new moon; specifically the Full Moon being the new moon. The pagan nations surrounding Israel observed the counterfeit new moon using the first visible crescent. The goddess Semiramis from ancient Babylon is pictured with the crescent moon and is worshipped by the pagans. Many Muslim nations have the crescent moon incorporated into their nations’ flags today. “He [Elohim] appointed the moon for seasons [mow’ed]” (Psalm 104:19). “And Elohim said, Let there be lights in the firmament of the heaven to divide the day from the night; and let them be for signs, seasons [mow’ed], and for days and years” (Genesis 1:14). “Concerning the feasts [mow’ed] of Yahuwah which ye shall proclaim to be holy convocations, even these are My feasts [mow’ed]” (Leviticus 23:2). In Genesis the only feast day (mow’ed) that was in existence at that time was the weekly Sabbath (Genesis 2:3, Leviticus 23:3). The Lunar-solar year which is the Biblical Calendar begins in the spring of the year (Exodus 12:2) and has twelve and sometimes thirteen months in a year. The Metonic Cycle, which repeats itself every nineteen years, includes twelve twelve-month years and seven thirteen-month years. There are astronomically speaking, six twenty-nine day months and six thirty day months in a twelve month year for a total of approximately 354 days. In a thirteen month year there are approximately 384 days. There are variations within the years because every other month is not twenty-nine or thirty days. Occasionally, there are two and sometimes three months in a row that have either twenty-nine or thirty days. The number of days between the Passover and the Feast of Trumpets has slight variations depending upon how many of the months contain twenty-nine days and how many months contain thirty days between the first month and the six month and is approximately 164 days. A twelve-month year of 354 days and two thirteen-month years of 384 days each, equals 1,122 days. Add the 164 days between the Feast of Passover and the Feast of Trumpets to the 1,122 days and we have 1,286 days. Add to that number ten days between the Feast of Trumpets and the Day of Atonement and you have 1,296 days. Add five days between the Day of Atonement and the Feast of Tabernacles and you have 1,301 days. Now add the possibility of four more days that could be picked up over a three-and-a-half year period for abnormalities (there can be two or three months in succession containing 29 or 30 days) in the months and you come up with 1290 days, 1300 days, and 1305 days. Please take note of these numbers as we will be looking at them throughout this chapter. The phrase “daily sacrifice” is used in verses 11 through 13. The word “sacrifice” is always in italics which indicates that the word is not in the original texts and was added by the translators. Those verses should read “daily” and not “daily sacrifice.” In Daniel 8:14, “daily” is not used. When it reads “unto two thousand and three hundred days” in the King James Version, all other translations referenced read “unto two thousand and three hundred evenings and mornings.” “Evenings and mornings” is the proper translation according to the Strong’s Concordance, and you will see why this is important. What is the “daily” and when and where did it take place? “And thou shall make an altar to burn incense upon: of shittim wood shalt thou make it . . . And thou shalt overlay it with pure gold . . . And thou shalt put it before the veil that is by the ark of the testimony, before the mercy seat that is over the testimony, where I will meet with thee. And Aaron shall burn thereon sweet incense every morning: when he dresses the lamps, he shall burn incense upon it. And when Aaron lights the lamps at even, he shall burn incense upon it” (Exodus 30:1-8, emphasis added). The services of the sanctuary consisted of two divisions: a daily, which we just read about in the above verses, and a yearly service. The “daily” service was performed at the altar of incense in the holy place in the morning and evening as we just saw in the above verses. The yearly service was on the Day of Atonement. So even though the word “daily” is not used in verse 14, the words “evening and morning” put it in the same context, for it was the “daily” which occurred in the “evening and morning” at the golden altar of incense. Incense was burned in the morning and in the evening on a “daily” basis at the golden altar of incense along with the lamps being trimmed and kept burning. Do you remember what we read in Daniel 7:25? “And he shall speak great words against the most High . . . and think to change times” (emphasis added). We have a very big problem in determining what was to happen in connection with the “two thousand and three hundred days.” Just what was to happen in connection with the “two thousand and three hundred evenings and mornings?” “Then shall the sanctuary be cleansed” (Daniel 8:14, emphasis added). In the discussion at the beginning of this chapter we talked about 1,290 days, 1,300 days, and 1,305 days but not about 2,300 days. If the 2,300 days in Daniel 8:14 should have been 1,300 days, do you see how this fits into the scenario given in Daniel 8 and Daniel 12? Some will be upset with me for thinking to change what is written here, but I believe I am just changing it back to where it was before it was changed by someone else? Daniel 7:25 is very clear in stating that someone will think to change the times. “Times” is plural which means there is more than one instance that this was done. Is this one of the places where this was done? Did someone else change what was written in Daniel 8:14? You be the judge, but hear the whole matter before you decide who is guilty of changing this time and see if what is being done makes sense when you see the entire picture that is presented to you in this chapter. When was the earthly sanctuary cleansed? The typical Day of Atonement occurred every year on the tenth day of the seventh month. The second of the Fall Feast Days was when the sanctuary was cleansed. The Day of Atonement followed the Feast of Trumpets, and we will see that the Feast of Trumpets is still in the future and has not occurred in the past. The Day of Atonement occurred just before the Feast of Tabernacles which celebrated the harvest. All three Fall Feasts are still in the future and will meet their fulfillment just before the return of Yahushua. Some have said that the Day of Atonement occurred in the fall of 1844, but if it did so when did the Feast of Trumpets occur back then? The Feast of Trumpets had to occur prior to the Day of Atonement. We saw in an earlier chapter that when the temple was opened and the ark of the testament was seen is still in the future and occurs when the seventh plague is poured out. See Revelation 11:19 and Revelation 16:17-21. This occurred after the sixth trumpet had sounded. Many have placed what is to occur in the future in the past because of misunderstanding when the events described in Revelation are to occur. Revelation is describing events that take place at the time of end just before the return of Yahushua. All year long the sins that had been confessed on “a kid of the goats” (Leviticus 4:27-28) slain for a sin offering were in type transferred to the earthly sanctuary before the veil separating the holy and the holy of holies. On the Day of Atonement, sins that had been accumulating there were “cleansed” from the sanctuary and confessed over the “scapegoat,” who was led out into the wilderness to eventually die. This service, described in Leviticus 16, was the most solemn service of the annual feast days, a day when the children of Israel were to “afflict [their] souls” (Leviticus 16:31, 23:28-32). What this service foreshadowed is seen in Revelation 20:1-3 when Satan is cast back into the “bottomless pit” which will be discussed when we get to Revelation chapter 20. When we place the 1,300 days in the time line found in Appendix A of this book, it coincides with Revelation 11:19 which reads: “The temple of Elohim was opened in heaven, and there was seen in His temple the ark of His testament.” The only time that “the ark of His testament” could be seen was on the Day of Atonement which if it actually should be 1,300 days instead of 2,300, agrees with other Scripture. The rest of Revelation 11:19 match up with the seventh last plague. “And there were lightnings, and voices, and thunderings, and an earthquake, and great hail.” “And the seventh angel poured out his vial into the air . . . and there were voices, and thunders, and lightnings; and there was a great earthquake . . . and there fell upon men a great hail out of heaven” (Revelation 16:17-21). Both of these portions of Scripture are describing the same event which occurs just prior to the return of Yahushua. We know that the seventh plague occurs just before the return of Yahushua and if “the temple of Elohim was opened in heaven,” it was opened at the time of the seventh last plague and the service conducted in the most holy place of heaven then takes place. 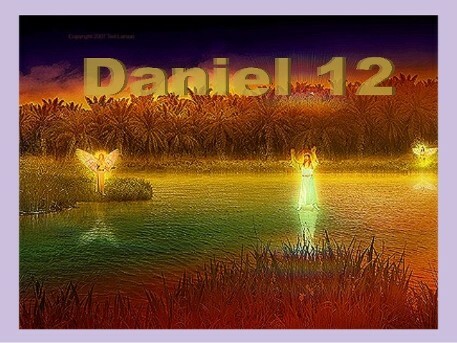 Now that the groundwork has been laid, we turn to Daniel 12. “And at that time shall Michael stand up, the great Prince which stands for the children of thy people: and there shall be a time of trouble, such as never was since there was a nation even to that same time: and at that time thy people shall be delivered, every one that shall be found written in the book” (Daniel 12:1, emphasis added). In Luke 10:20, Yahushua tells His disciples, who were elated over the power that had been given them (Luke 10:17-20), “notwithstanding in this rejoice not, that the spirits are subject unto you; but rather rejoice, because your names are written in heaven” (Luke 10:20, emphasis added). In Daniel 12:1, we are reassured that “every one that shall be found written in the book” of life “shall be delivered.” The “great Prince” (Daniel 12:1) is the same “Prince of the host” (Daniel 8:11) to whom the “little horn” (Daniel 8:9) “magnified himself” (Daniel 8:11), and as we saw, was identified as the “king of fierce countenance” (Daniel 8:23) who was further identified as Satan. The “Prince of the host,” “the great Prince,” and “Michael” are the same Being. Yahushua Messiah is the “KING OF KINGS, AND LORD OF LORDS” (Revelation 19:16), and He is also the Prince of the hosts of heaven and “Prince of the kings of the earth” (Revelation 1:5). It is interesting that Daniel chapters 8 and 12 use the word “Prince” to refer to Yahushua along with having the term “daily” in common seemingly, and I believe purposefully, tying these two chapters together. There are prophecies with literal time elements that need to be understood specifically associated with the final events leading up to the second coming of Yahushua. If we are in “the time of the end,” should we expect those times to be opening up to our understanding? “Many shall be purified, and made white, and tried; but the wicked shall do wickedly: and none of the wicked shall understand; but the wise shall understand” (Daniel 12:10, emphasis added). Elohim does not sprinkle fairy dust over us to magically enable us to understand what is written; we are admonished to “study to show thyself approved unto Elohim, a workman that needs not to be ashamed, rightly dividing the word of truth” (2 Timothy 2:15), and the Spirit of Elohim will be guiding us into the truth and showing us things to come (John 16:13). We are to seek approval from Elohim and not the favor of man. Too many want the respect of their fellow man more than they want Elohim’s approval and go along with interpretations that have been handed down through time but are not in harmony with the Word of Elohim and the Spirit of Elohim. Do you want to be in the wise or the wicked group? If you are in the wise group and do your homework, you will understand, for Elohim’s Spirit will guide you as you hunger and thirst for truth (John 16:13). Truth is not for all men, but only for those who seek it. Many are fearful of questioning what they have been taught and refuse to listen to anything contrary to their previous held beliefs. Truth is available only to those who have the courage to question whatever they have been taught. Many will be surprised when the scenario of last day events does not happen in the sequence they expected. The promise to the hungry is, “He hath filled the hungry with good things; and the rich He hath sent empty away” (Luke 1:53) will be realized. If you are content with what you understand then you will go away empty. Those who think that they are “rich and increased with goods and have need of nothing” (Revelation 3:17) will not understand. As stated earlier: Elohim works on a need-to-know basis, and previous generations did not need to know what the books of Daniel and Revelation were saying to their generations because what was shown to Daniel and John will be taking place during our lifetime at “the time of the end.” We are told “For verily I say unto you, That many prophets and righteous men have desired to see those things which you see, and have not seen them; and to hear those things which you hear, and have not heard them” (Matthew 13:17). Deuteronomy 23:21-23 tells us it is better for us to not make a vow than to make a vow and not fulfill it, and we must “keep and perform” the vows we make. If Elohim expects this of His children, we have the assurance He will do as He has promised: “For He is faithful that promised” (Hebrews 10:23) and is not a hypocrite Who tells us to do one thing, and then He does just the opposite. He holds Himself to the same standard as He holds us to. In the coming conflict we are about to enter or may have already entered, depending on when you are reading this book, you will need an unshakeable confidence in Elohim! It is not so much what we know, as Who we know that will carry us through “the time of trouble, such as never was since there was a nation” (Daniel 12:1). Knowing that Elohim is completely dependable and can be trusted fully is a must if we are to go through to the end and be found faithful. The only thing that was worse than the forthcoming “time of trouble” was the flood at the time of Noah. We have no known history of the earth before the flood other than what the Bible tells us, but “nations,” as mentioned in Daniel 12:1 came about after the flood and after the time of the tower of Babel. I was in Vietnam between October 1968 and June 1970. Everyone I knew who was there had a short-timer’s calendar. You were assigned for one year to Vietnam unless you were as stupid as I was and volunteered to extend that time. I did that so I could get out of the service five months early. The military base where I was stationed was very secure, and I always knew how many days I had left “in country” unless I was seriously wounded or killed. Most of us eagerly looked forward to getting out of Vietnam. I sometimes wonder if we are as eager to leave this sin-ridden world where Satan rules to the extent permitted by Elohim (2 Corinthians 4:4), or have we become so accustomed to living our lives here that we do not realize something is radically wrong here and that there is something infinitely better awaiting us? Can you see how this applies to us living in the last days? Vietnam was a “walk in the park” compared to what we will be facing at the time of the end, but knowing the length of time left until the return of Yahushua to rescue us will encourage us on our way and not give rise to false expectations. Elohim has been preparing many of us through life’s experiences in order that we might fight the good fight of faith and be rescued in the end. The Bible talks about “our light affliction, which is but for a moment [in time], works for us a far more exceeding and eternal weight of glory” (2 Corinthians 4:17). The Bible talks about our feet becoming like “hind’s feet.” Hind is a deer which lives in mountainous terrain. “Yahuwah Elohim is my strength and He will make my feet like hind’s feet, and He will make me to walk upon mine high places” (Habakkuk 3:19). Elohim has high goals, expectations, and desires for us, and if we can endure the discipline, we shall reach His desire for us. “For Thou, O Elohim, hast proved us: Thou hast tried us, as silver is tried. Thou brought us into the net; Thou laidst affliction upon our loins. Thou hast caused men to ride over our heads; we went through fire and through water: but Thou brought us out into a wealthy place” (Psalm 66:10-12). Certain events are connected with the time prophecies of Daniel 8 and 12. In Daniel 12:7, we read, “And I heard the man clothed in linen, which was upon the waters of the river, when he held up his right hand and his left hand unto heaven, and swore by Him that lives forever that it shall be for a time [360 days], times [720 days], and a half [180 days]; and when he shall have accomplished to scatter the power of the holy people, all these things shall be finished” (emphasis added). In Daniel 8:24, the “little horn” was identified as Satan who “shall destroy the mighty and the holy people.” When Satan scatters “the power of the holy people all these things shall be finished.” When and how this takes place is described in Revelation 11:7. Some have said that this time period mentioned in Daniel 12:7 ended in 1798, but can that be true? What takes place at the end of the 1260 days (“time, times, and an half”) mentioned in Daniel 12:7? “When he shall have accomplished to scatter the power of the holy people, all these things shall be finished” (Daniel 12:7). This did not happen in 1798, did it? Were “all these things . . . finished” in 1798? The Word of Elohim was only beginning to be circulated in an unprecedented manner at that time, and the Church of Elohim was experiencing liberties and freedoms that were unknown before in proclaiming the truths of the Bible. Satan was not scattering “the power of the holy people” in 1798, but he will at the end of time, after the 1260 literal days from the first global earthquake. We saw in an earlier chapter how Satan will kill the 144,000 after they have given their testimony for 1260 days (Revelation 11:3, 7). “And from the time that the daily sacrifice shall be taken away, and [until] the abomination that makes desolate set up, there shall be a thousand two hundred and ninety days” (Daniel 12:11). We asked earlier: what is the “daily?” The Bible mentions “daily sacrifice,” and it was shown that the word “sacrifice” is in italics and is not in the original manuscripts it was translated from. Where does the “daily” take place? When does it take place? The “daily” took place at the golden altar of incense in the holy place in the morning and in the evening. The earthly sanctuary was made after the pattern of the heavenly sanctuary (Hebrews 8:5). Can we discover when the heavenly “daily” is taken away? We saw in Daniel 7:26 that a heavenly event is accompanied by an earthly event. “But the judgment shall sit [the heavenly event], and they shall take away his dominion” [an earthly event] – taking away the papacy’s power when the pope was imprisoned by the French army in AD 1798. When this occurred, it signaled that the judgment of mankind had begun in heaven in AD 1798. In Revelation 8:2-5, we read, “And I saw the seven angels which stood before Elohim; and to them were given seven trumpets. And another angel came and stood at the [golden] altar, having a golden censer; and there was given unto him much incense, that he should offer it with the prayers of all saints upon the golden altar which was before the throne. And the smoke of the incense, which came with the prayers of the saints, ascended up before Elohim out of the angel’s hand. And the angel took the censer, and filled it with fire of the altar, and cast it unto the earth: and there were voices, and thunderings, and lightnings, and an earthquake” (emphasis added). We saw in Exodus 30:1-8 the “daily” took place at the golden altar just as we see this angel with the golden censer standing at the golden altar. What is the significance of his casting the golden censer down to the earth? Is the “daily” being taken away as mentioned in Daniel 12:11? If that is true, then the first global earthquake that is accompanied by “voices, thunderings and lightnings,” is the earthly event that signals to us that the “daily” has been taken away - the heavenly event. We can follow what is going on in heaven by witnessing events taking place here on the earth! The 144,000 have been sealed or will be sealed at this time and will receive the “latter rain” power of Spirit of Elohim. This global earthquake will occur on the preparation day of the Passover (John 19:14) which occurs in the first month of the Biblical Calendar. “Be glad then, ye children of Zion, and rejoice in Yahuwah your Elohim: for He hath given you the former rain moderately, and He will cause to come down for you the rain, the former rain, and the latter in the first month” (Joel 2:23, emphasis added). The “former rain” fell at the beginning of the planting season and the “latter rain” fell at the harvest time to bring the crops to maturity. We are at the end of this earth’s history when the wheat and tares will reach peak ripeness before they are harvested as shown in Revelation 14:14-20. The starting point (event) for the 1290 days is the first global earthquake (Revelation 8:5), and the ending event is “the abomination that makes desolate set up” (Daniel 12:11). From the first global earthquake which signals that the “daily” has been taken away until the abomination that makes desolate will be twelve hundred and ninety days. The first global earthquake is also the starting point for the “time, times, and a half” of Daniel 12:7. The starting point for the 2,300 days (which I believe should be 1,300 days) is the same global earthquake which is accompanied by “voices, thunderings and lightnings,” and from the preparation day for the Feast of Passover (John 19:14) to when the sanctuary is to be cleansed is 1,300 days. The starting event for 1335 days mentioned in Daniel 12:12 is also the first global earthquake. Here is a second problem I would like you to consider with me. Again, remember what Daniel 7:25 stated. He shall “think to change times.” What if the Hebrew word for “thirty” (Hebrew word will not post on this web site.) should not be there? Again, I am not saying it should or that it should not be, but when you see what is about to occur when we use 1,305 days instead of 1,335, you will see where I am going with this and why. As discussed earlier in this chapter, the Fall Feast Days occur on specific days of the Biblical Calendar which are determined by the moon. The fall feast days occur on the first, the tenth, and the fifteenth day of the seventh month. When you take the preparation day for the Feast of the Passover (John 19:14), on the thirteenth day of the first month when the first global earthquake occurs as the starting point, for the 1,290, 1,300, and 1,305 days and use the Metonic cycle as discussed earlier in this chapter, the fall feast days approximately three and a half years later are 1,290 days for when the “abomination of desolation” occurs, 1,300 days for when the sanctuary is cleansed, and 1,305 days for when I believe the special resurrection mentioned in Daniel 12:2 will occur. The conclusions of what occurs when these changes are made are compelling, but only time will determine whether there is any merit to this. When you put these dates into the timeline in Appendix A, they fit like a glove. If the global earthquake, signaling the end of the “daily” occurs on the Feast of the Passover (actually on the preparation day for the Passover [John 19:14]) according to the Lunar solar Calendar when the full moon is used as the new moon, I can guarantee the events connected to the 1,290 days, 1,300 days, and 1,305 days are correct as well and will occur at those times. Remember that when the sanctuary is cleansed, the sins that had been accumulating over the previous year were removed from the sanctuary before they were placed on the scapegoat. The scapegoat is Satan, who will take the final punishment for the sins of Elohim’s people from throughout history which have been forgiven. On this day the announcement found in Revelation 22:11 is declared: “He that is unjust, let him be unjust still: and he which is filthy, let him be filthy still: and he that is righteous, let him be righteous still: and he that is holy, let him be holy still.” There is no more atonement that can be made for mankind. The atonement has been made, and it is now too late for anyone to change their mind and this occurs when the seventh plague takes place just prior to when Yahushua returns. In Revelation 20:1-3, Satan is confined to the “bottomless pit” by an angel; in the Old Testament, this was symbolized by the taking of the scapegoat by a strong man outside the camp to a land not inhabited, which will be the state of the earth for the one thousand years following Yahushua’s return. This was done in type and pictured for us in Leviticus 16:20-22. The wicked have been destroyed by the brightness of Yahushua’s return and the righteous have been taken to heaven, so all of earth’s inhabitants are gone for the 1,000 years. The condition of the earth during this time is described in Jeremiah 4:23-28. What is “the abomination that makes desolate?” We have discussed this previously, and we will be addressing this subject again in later chapters. The early Christians believed that they saw “the abomination that makes desolate” spoken of in Daniel 11:31 when Titus’ armies surrounded Jerusalem (Matthew 24:15; Mark 13:14), and they were then to flee from Jerusalem at their earliest opportunity. When they saw this fulfilled in their day, they fled, and from what we know, not one Christian was killed or captured when Jerusalem was overthrown in AD 70. This abomination that the disciples were warned of is found in Daniel 11:31 and is not the same as the one mentioned in Daniel 12:11 that we are discussing. The “abomination that makes desolate” which we are to be concerned with is mentioned in Daniel 12:11 and is when Satan sets up his throne in Jerusalem. The earthly “daily” was taken away on the preparation day of the Feast of Passover (John 19:14) when Yahushua was crucified. All the sacrifices which were offered in the earthly ceremonies were typical of the sacrifice Yahushua would make in His atonement for sin and were patterned after the heavenly sanctuary service. The earthly sacrifices had no more merit after that Sacrifice was made because they were “shadows” of His Sacrifice. When Yahushua died, an earthquake signaled His death which made void the earthly system of sacrifices which included the earthly “daily,” just as an earthquake will occur at the time the heavenly “daily” is done away with. “And behold, the veil of the temple was rent in twain [two] from the top to the bottom; and the earth did quake, and the rocks rent” (Matthew 27:51, Mark 15:38, Luke 23:45). The earthly system of sacrifices and oblations was done away with at that time (Daniel 9:27). Will this global earthquake mentioned in Revelation 8:5 accompanied by “voices, and thunderings and lightnings occur on a preparation day of the Passover (Daniel 12:11; Revelation 8:2-5; John 19:14)? Remember that the earthly sanctuary service was patterned after the heavenly sanctuary (Hebrews 8:5). “Blessed is he that waits, and comes to the thousand three hundred and five and thirty days.” (Daniel 12:12) And if it should read one thousand and three hundred and five days instead of “the thousand and three hundred and five and thirty days” as translated in the Bible, this will be a day of great rejoicing. Those who come to that day are to be blessed. The people who died under the proclamation of the third angel’s message are also said to be blessed. Will they be blessed by the same event? “Blessed are the dead which die in Yahuwah from henceforth” (Revelation 14:13). Those who have been put to death during the third angel’s message of Revelation 14 warning against receiving the mark of the beast or worshiping the image to the beast will be resurrected to witness the return of Yahushua. The Feast of Tabernacles was a time of great rejoicing and occurred at “harvest time.” Yahushua, at this time, is about to harvest the redeemed from this earth (Revelation 14:16-18). In Daniel 12:2, we read, “And many of them that sleep in the dust of the earth shall awake, some to everlasting life, and some to shame and everlasting contempt.” This is a special resurrection apart from the resurrection mentioned in 1 Thessalonians 4:13-17; only the righteous are resurrected at that resurrection. The resurrection pictured in Daniel 12:2 has both the lost (“some to shame and everlasting contempt”) and the righteous (“some to everlasting life”) being resurrected. Elohim will not disappoint those who had looked forward to Yahushua’s return and even though they are put to death for not worshipping the image of the beast or receiving his mark during the last days, they will be resurrected along with certain of the wicked; especially those who crucified Him to watch Him return. In Revelation 1:7 shows that certain of the wicked are to be resurrected. “Behold He [Yahushua] cometh with clouds; and every eye shall see Him, and they also which pierced Him” (emphasis added). In recent years there has been a revival of the observance of the annual feast days as given in Leviticus 23, including the weekly feast day – the Lunar-solar Sabbath (Leviticus 23:3). The children of Israel were commanded to come to the three annual week long feasts each year. While I do not believe we are to go to Jerusalem to observe these feast days, I do believe we need to gather on them. The weekly and the annual feast days were set apart times for Elohim to meet with His people, and so they still are. “Speak unto the children of Israel, and say unto them, Concerning the feasts of Yahuwah, which you shall proclaim to be holy convocations, even these are My feasts . . . These are the feasts of Yahuwah, even holy convocations, which you shall proclaim in their seasons” (Leviticus 23: 2, 4, emphasis added). These are times in which Elohim meets with His people and pours out His Spirit upon them. These are the times that He has set aside to be with His people just as some earthly parents set aside specific times to be with their children. Elohim’s children in these last days need to gather together on His appointed days He has set aside to meet with them. On the preparation day of the Passover, Yahushua, by His sacrifice, did away with the earthly “daily” that had pointed to His sacrifice. On a preparation day of the Passover in the future, Yahushua will end the heavenly “daily” marked by the first global earthquake and the countdown can begin. On the sixteenth day of the first month, the wave sheaf offering was made; “a sheaf of the firstfruits of your harvest” (Leviticus 23:10). In 1 Corinthians 15:23 we are told that “Messiah the first-fruits; afterward they that are Messiah’s at His coming.” As the “firstfruit” Yahushua ascended to heaven prior to appearing to all the apostles (John 20:17). We are told of another “first-fruits” in Revelation 14:4; the 144,000. Are the 144,000 the wave sheaf offering at the end of time and the “great multitude” the main harvest at the end of time? The 144,000 will ascend to heaven three and a half days after they are put to death and brought back to life (Revelation 11:11-12) and presented to Yahuwah as the “firstfruit” (Revelation 15:1-8). When in the future will these events occur? Can we know? Many quote the verse that says, “But of that day and that hour knows no man, no, not the angels which are in heaven, neither the Son, but the Father” (Mark 13:32). Some verses mention only the day will not be known. For forty-four years I have heard “He is coming soon.” Sometimes we can play right into the Devil’s hands and not even know it. It is like the story of the little boy that hollered “wolf, wolf” when there was no wolf. He hollered it so often that people eventually ignored him. Then one day the wolf showed up and when he hollered “wolf, wolf” the people ignored him to his demise. I can remember hearing one sermon some 10-15 years ago in which the minister said “Yahushua was coming soon, and it could be only months.” That was 10-15 years ago! I am fearful of what is happening in the world today. People have become so accustomed to hearing the phrase “Yahushua is coming soon” and may be turning a deaf ear to those words. Or they have waited for so long that they may have thought themselves deceived. How long is soon? The Devil is a master at playing with our minds and deceiving us. There is a reason Revelation 12:9 tells us “the devil, and Satan, which deceives the whole world.” He has many tricks in his bag that he has perfected over the 6,000 years he has been deceiving mankind. I was not going to include the following portion in this book, but when Elohim disturbs your sleep to get His point across to you, I have no other choice but to follow and do what He tells me to do. When He calls we must respond to Him (Isaiah 65:12, 66:4). I believe from my studies which can be found at the following link http://globalimpactstudies.com/jubilee-years---charts-1-and-2.html you will see there is ample evidence to substantiate what I am about to tell you. There is only one period of time in the near future where these days can reach their fulfillment of 1,290, 1,300, and 1,305 days in close proximity to the days of the Biblical Calendar and that period is AD 2027 to AD 2030. It is a seven part study with charts showing the evidence that I base these dates on. The study would be impossible to include in this book. The above link is Part 1 of the seven part study and the rest of the study can be accessed at the bottom of each study. I do not like to have unrealistic expectations, and I hope you do not either. It is my belief that the month and year can be known when Yahushua will return. “But thou, O Daniel, shut up the words, and seal the book, even to the time of the end: many shall run to and fro [a Jewish idiom for thinking upon time], and knowledge shall be increased” (Daniel 12:4). If the knowledge was to be sealed up until “the time of the end,” and what you have just read is true, do you think we are on the verge of seeing for ourselves all that Daniel and John in the Revelation saw in their visions? Go, Tell the World of Their Danger! I do! 1. What event occurs when the heavenly “daily” is taken away? 2. What event occurs at the 1,290th day? 3. What event occurs at the 1,300th day? 4. What event occurs at the 1,305th day? 5. Do the yearly feast days mentioned in Leviticus chapter 23 still have meaning for us today? Below are the studies mentioned above pertaining to the day when Yahushua will return. You can access them by clicking on the one you are interested in. It is recommended that they looked at in the order given. Click on the following links for more info on the desired subject. Box in red is the link you are on at the present time.